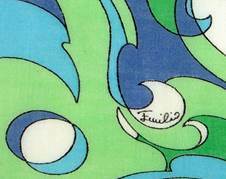 When the swinging 60’s ushered in a world of psychedelic graphics, one artist’s images stood head and shoulders above the rest – Emilio Pucci. 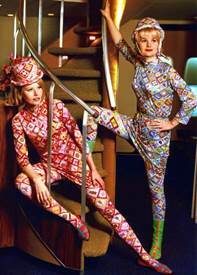 It’s not surprising, however, since Pucci’s dazzling originality predated the Summer of Love by two decades. His seminal ideas and epochal images were forever ahead of convention, and stand today as timeless classics. 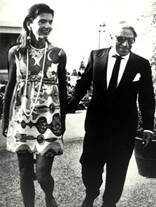 Born Marquis Emilio Pucci di Barsento to an aristocratic family in Florence, Italy, Pucci’s early years reflected a life of privilege, which included skiing, fencing, tennis, and race cars. His early exposure to the finer things surely influenced his desire to explore, experience and savor life as an adventure. While studying in America, WWII commenced in Europe, and Pucci found himself cut off from all family funds. Never fear. The ever resourceful Pucci, on ski holiday at Mt. Hood, Oregon, returned and struck a deal with Reed College in Portland, offering to coach Reed’s first ski team in exchange for room, board and tuition. 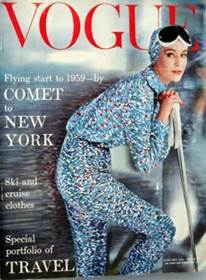 Having represented Italy in the 1932 Winter Olympics at Lake Placid, Pucci had the credentials and chutzpah to make it happen. He many have been nobility, but he was not too proud to wait tables and wash dishes for spending money. He also designed uniforms for the ski team, a portent of things to come. Graduating from Reed, Pucci returned to Florence and served as a fighter pilot in the Italian Air Force in Ethiopia. Recovering after the war in Zermatt, he was once again giving ski lessons and designing ski apparel, this time utilizing lightweight, stretchy fabric. A fashion photographer from Harper’s Bazaar captured his creations on film and the rest is history. 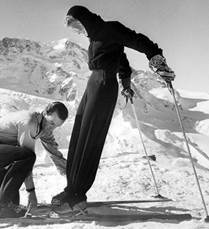 Bazaar’s editor asked him to design a line of skiwear which ran as a feature in 1948. He went on to design swimwear, clothing, and accessories. Pucci set up his atelier in the family palazzo and over the years became known worldwide. His lightweight jersey fabrics were wrinkle proof, and perfect for the jet set crowd, including Jackie Onasis, HRH Princess Grace of Monaco, (turning the tables on the paparazzi), Jane Fonda, and Marilyn Monroe among others. 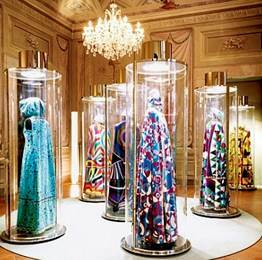 Pucci captured the high ground in terms of innovation, originality and excitement. 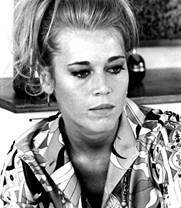 His creations embodied the swinging 60’s and beyond. 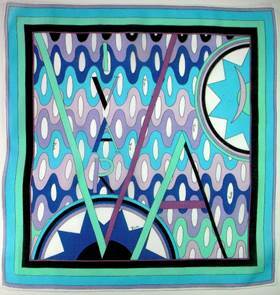 These handkerchiefs epitomize his energy, imagination and spirit. The olive and lime with pops of purple sing “Let’s dance the night away”, while the wavy blue and turquoise image carry us out to sea on a cool summer evening. 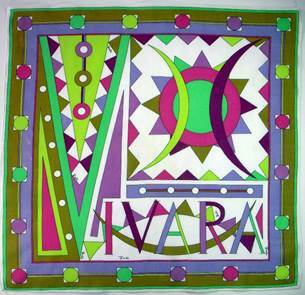 Both contain the word “Vivara” with which I was unfamiliar. 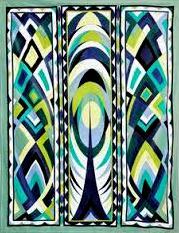 Pucci also created a green floral fragrance named Vivara, with notes of almond, amaretto, jasmine, narcissus, and orange blossom. According to Sephora, these aromatic fragrances of the Mediterranean are designed to “sweep you away on imaginary journeys.” Well, I’m on board. I assumed Vivara must be a jet set resort, where these splashy accessories would look luscious poolside, but I was in for a surprise. 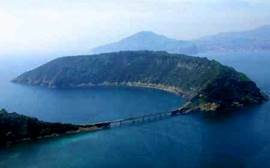 Vivara is a tiny islet of Porcida, one of the three main islands in the Gulf of Naples. The other two islands are Ischia and Capri. 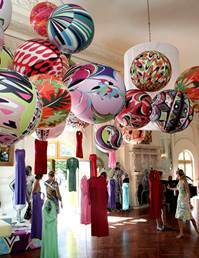 Pucci obviously loved this area, as he opened his first boutique La Canzone del Mare (The Song of the Sea) on the island of Capri. Here he sold chic sportswear, Capri pants, silk twill shirts, jersey tops and more. How will we get to Vivara? 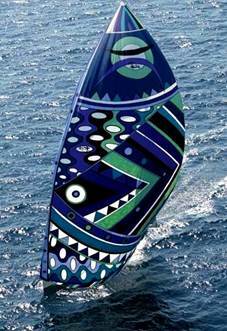 Don our Pucci shades, pack a gourmet picnic, hoist our vibrant sail (hand painted for Wally Yachts) and we’re off! Then it’s back to the palazzo to take in some of the master’s creations. Never resting on his laurels, Pucci later in life earned a doctorate in Political Science and Law from the University of Florence and served two terms in the Italian Parliament. Oh to have his energy and dedication. 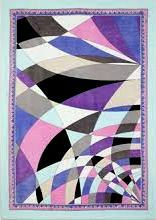 Pucci was a consummate professional in whatever endeavor he undertook, and the results speak for themselves. His stunning couture reflect his passion, his work ethic, his soul. We are the richer for having his creations to enjoy. 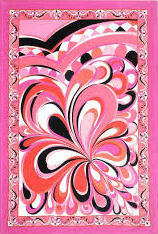 A Pucci design is instantly recognizable, like a Birkin Bag or Cartier tank watch, with or without a logo. In years past, it was the allure of the design, not the status of the logo that attracted customers. A couture house garnered followers based on the grace and beauty of their creations. Today, labels have shifted from inside to outside the clothing, often appearing on shoes, bags and outfits that could be interchangeable from designer to designer. Recently I attended a reception, where one attendee displayed logos from no less than five designers. She was a veritable billboard of popular couture. It makes one appreciate all the more the way Pucci’s miniscule moniker alights like a whisper, not a shout. It appears to have drifted in, like flower petals scattered in the wind. Tiny, modest, unobtrusive. Methinks Pucci may have utilized his petite symbol with a sly wink to clever merchandising. Like a speck of lint on a navy suit, it catches your eye and you can’t turn away. You squint and wonder – what is that? 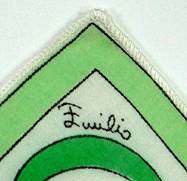 Ahhhhh…Emilio. 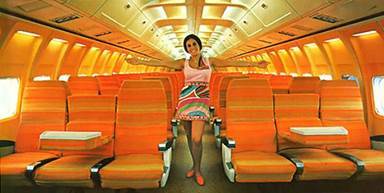 In these Braniff Airline photos, note the absence of seat belts, not to mention the generous space between seats (in coach, no less). The second photo illustrates the Pucci mini-skirt could also be worn over pants. The hippie with the headband working on her macramé in the front row confirms this is the 1960’s. No wonder everyone is smiling. They actually have room to move! I CAN JUST IMAGINE FLYING ON THAT PLANE! 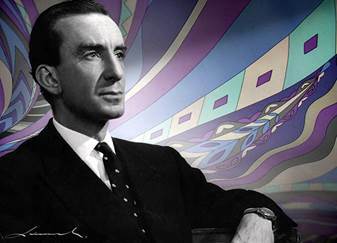 You certainly put a great deal of research and work into creating your handkerchiefheroes blog, and I have particularly enjoyed your most recent one highlighting Emilio Pucci. 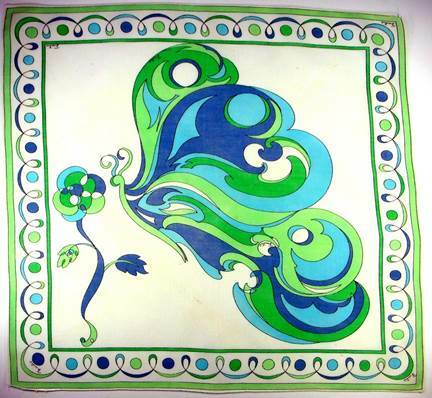 I lived in Italy throughout the 60s so learning more about him (for instance, his connection with Reed College) was fascinating.You are supremely clever in how you tie together your interest in handkerchiefs and the history behind different designs. What a tremendous amount of work. Well done! !